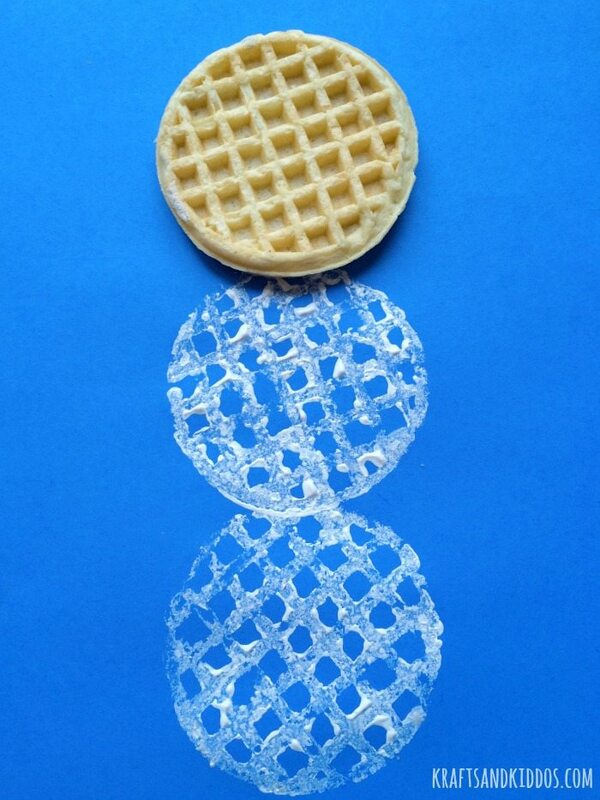 Follow our simple tutorial to create your very own Waffle Snowman Art Project. Super simple craft for the kids using no paint brushes! Hi Everyone! 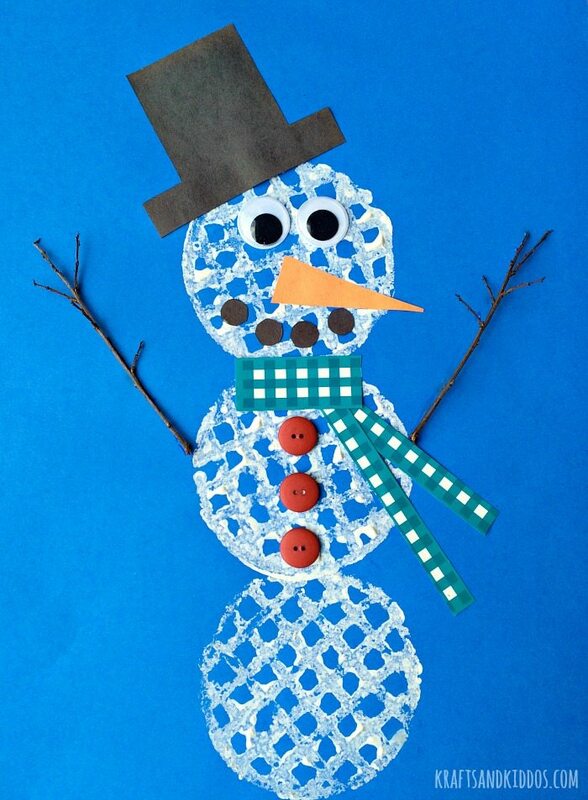 I’m Heather from Krafts and Kiddos, here again this month to share a fantastic winter craft for the kids. I love stopping by Juggling Act Mama to share something new with you. Kids crafts and activities are what we do best, over at Krafts and Kiddos. 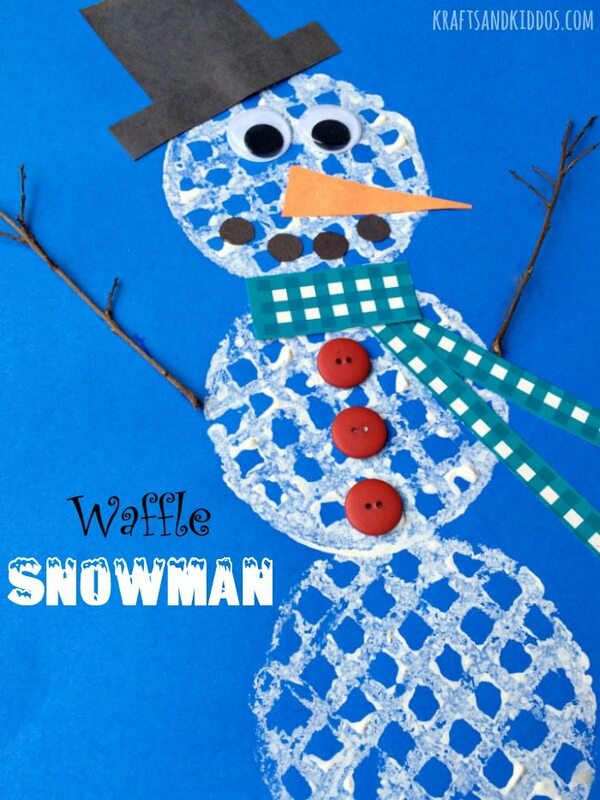 Today, follow along as we show you the perfect winter craft, a Waffle Snowman. Creating crafts using non traditional items, is always a favorite at our house. So I’ll show you how to create your very own Waffle Snowman this season. Perfect for a cold winter day, while sipping some cocoa with the kids, or even a great craft for a school project too! Creating your Waffle Snowman is actually easier than you may think. If you have frozen waffles on hand, plus a few basic items, you are well on your way to creating your festive little snowman. My kids are almost 3 years apart, so I enjoy crafts that are good for both kids. This one is ideal for kids of different ages and skill levels. You can let the kids be as creative as they’d like, adding their own personality to their artwork, which is my favorite part……sparking their imagination. Are you ready? Then, let’s get started…. First you’ll need a few basic supplies. 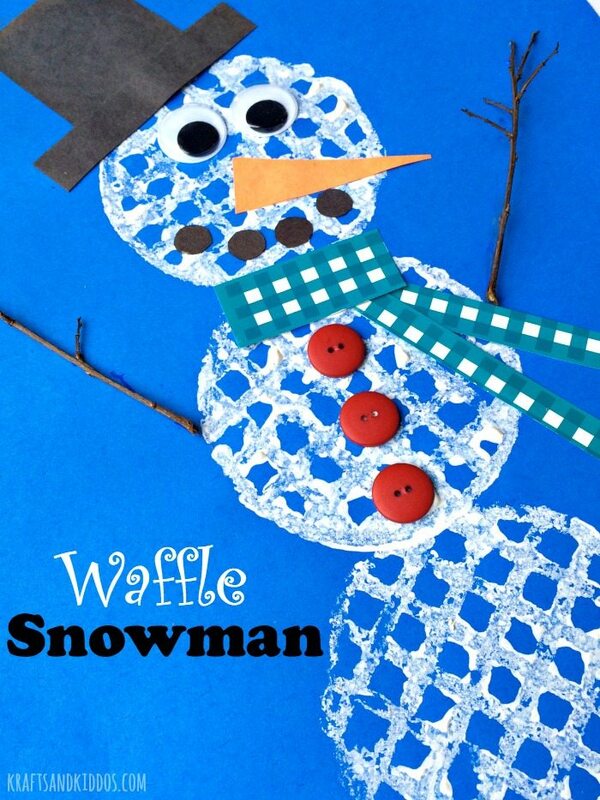 Start with your large blue construction paper on a flat surface, grab 1 frozen waffle and some white paint. Dab a sponge brush into your white paint and apply over the bottom of a waffle. 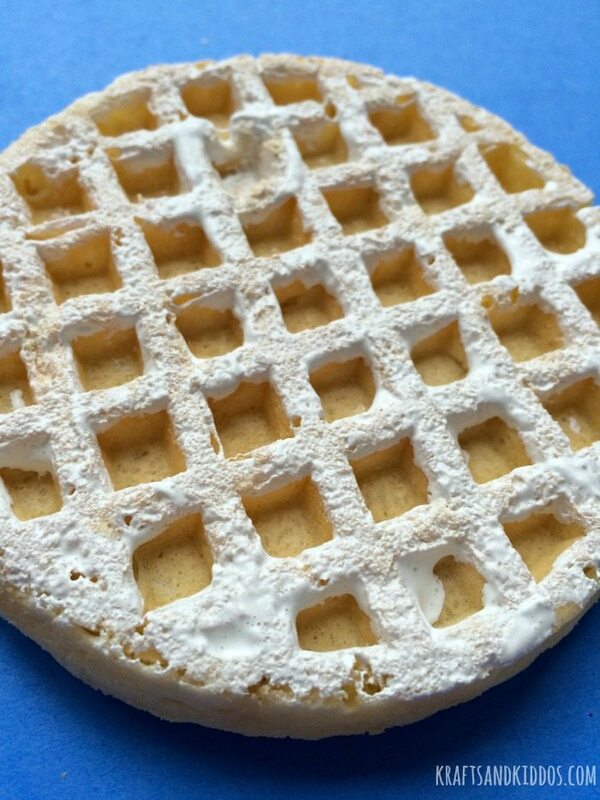 Apply white paint completely covering the back of your frozen waffle. Next, apply your waffle to the bottom of the blue construction paper. Repeat this step 3x, until you have 3 parts for your snowman. Once you’re done with your waffle, you can re-use immediately to create more snowmen, or toss out. You’re all done with the waffle. While the paint is drying, grab some black and orange construction paper. Cut out a triangular nose using your orange paper. Cut to 3 inches long. 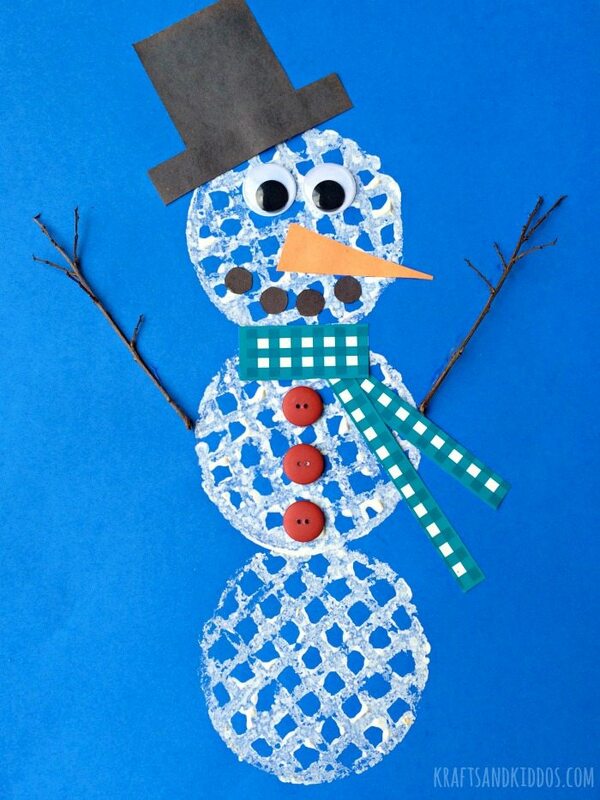 Also cut squares to create your snowman hat. Our black hat is 2″ x 3″ in size. Also cut a thin black strip for the edge of the hat. Next cut some small black circles out for the mouth using black construction paper. The white paint from the waffle should be dry enough at this point, if not – just wait a few more minutes. Now you are ready to glue your face onto your snowman. 1. Glue the hat on top. 2. Glue 2 wiggly eyes on. 4. Glue 4 small black circles as the mouth. Now you’re ready to add a fun scarf to your adorable little snowman. 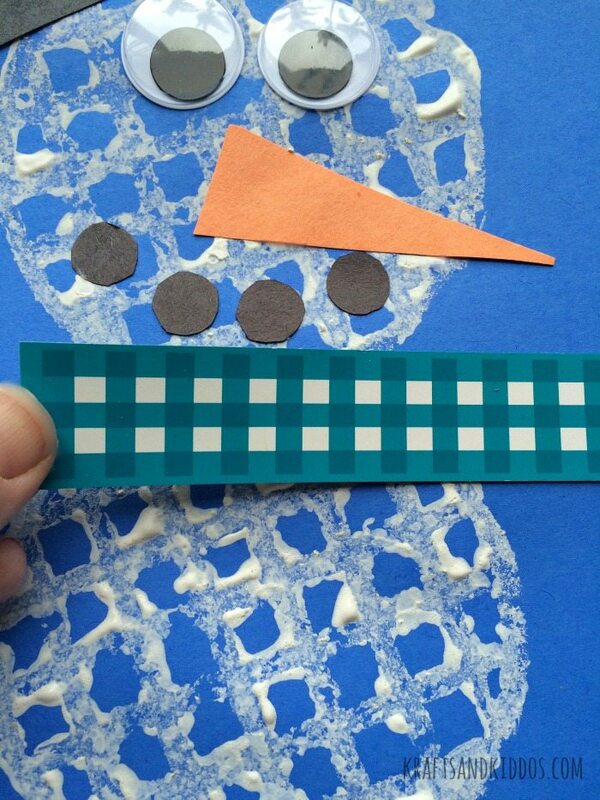 Using some scrapbook paper or construction paper, measure the width of the neck and cut a strap for your snowman’s scarf. Do the same thing to make the bottom of the scarf. Glue your scarf in place. 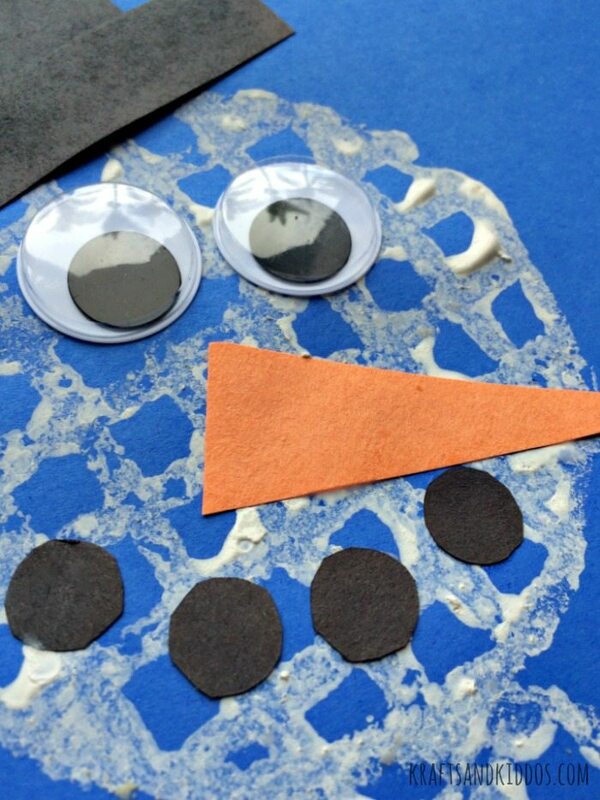 Lastly, glue buttons onto your snowman’s body. Choose any color or size you think looks best. 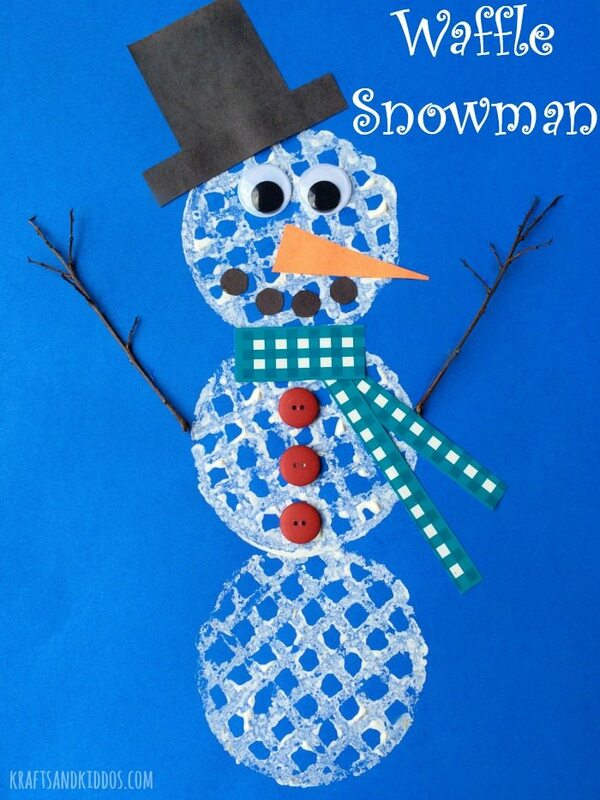 Add some character to your snowman and have some fun! Now for the final touches, glue two twigs onto your snowman to create arms. We looked around our yard for this part. We used some small twigs from an apple tree. If you have any trouble using regular glue for this, a glue gun (used by parents only) may help hold your twigs in place. We had such a great time creating our waffle snowman. It’s fun to try a new way to create art with the kids, instead of using paint brushes. It’s a great craft to let the kids express their creative side while having fun. I hope you enjoy creating your snowman, just as much as we did! Thank you for so much for following along with me today. Big thanks to Juggling Act Mama for having us today. I hope found some inspiration for your next winter craft. I look forward to sharing another exciting post with you next month. Wishing you a Happy Holiday from Krafts and Kiddos. Thanks Danica, a fun winter craft for sure! Thanks Danica for sharing! Enjoy your weekend. What a cute idea, my daughter would have so much fun with this. Pinning for later. This is such a fun craft to do with the kids! And what a creative way to do it with the waffles. Pinned! Very cute craft! That would be fun for a preschool classroom as well! Good idea Gina, you’re right a classroom would love this for fun winter craft! Thanks for stopping by. i LOVE this! I may do it today!! Oh fun Christy!!! Let us know how yours turns out, I’d love to know what you think, have fun! Oh my goodness these are so cute! I don’t have any waffles but I may just have to go buy some to make these!! Thank you for sharing Kimberly! Thanks so much for sharing with us at Talented Tuesdays! I’ll be featuring you this week! I hope you link up more of your cute crafts with us this week. Heather, how adorable! I love decorations with snowmen. What a fun project for little ones. I’ll have to remember this one when my grand daughter is old enough! Thanks so much Jane, we love snowman decorations and crafts too! Thanks so much for sharing Michele! You’re so creative with all these diy crafts!!!! Pinned! Thank you so much Krissy for featuring our Waffle Snowman this week, looking forward to stopping by to join the fun!